If so, the eleventh edition of The Amarider 100Miler, presented by The Bike Hub is the perfect race to get it done. Held in Malmesbury on the 13th of April, this race is the ultimate Swartland meander offering dirt road riding around the Kasteelberg and surrounds. This event will start early morning just as the sun is rising, with astounding scenery that is spellbound to keep the legs going for many hours. Only pre-entries will be accepted for both distances. Entries are limited and remember that this is a seeding event for Stellenbosch MTB Challenge 2019. Four spectator points – go and support the riders! For the not so brave there are a 50 Miler (80km) which starts at Riebeeck Kasteel (Delico Butchery) and finishes in Malmesbury (please note entries are limited and only pre-entries are taken). There will be a shuttle from the finish to the start at Delico at 07h30 and there will be NO shuttle available in the afternoon. Shuttle: Ensure you book and pay early as the shuttle has been fully booked in previous years. R180, Mail Alanda to secure your spot – admin@dirtopia.co.za. Please try and arrange lifts with your friends or family. It is a 25km drive from the finish to the start. You will need an Amarider Trail Tag to be timed for this event, you will tag in and out at various check points along the route.The Trail Tags are available for purchase at R100 or for rent at R50. You’ll use the Tag at most Dirtopia and Amarider events, so you might as well purchase one. If you don’t have a Trail Tag you MUST purchase a temporary Trail Tag at R50 OR a permanent Trail Tag at R100 upon entering. 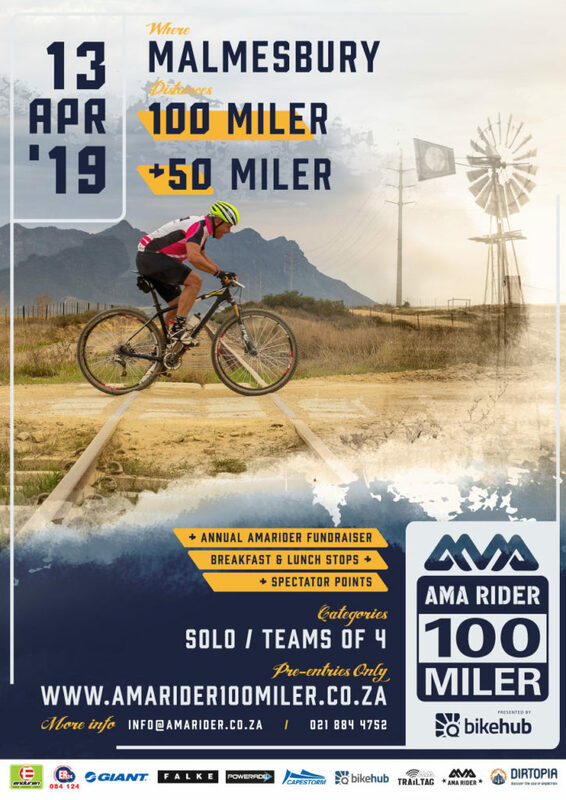 According to Meurant Botha, director of Amarider, the 100 Miler was created to become a primary fundraiser for the organisation. Amarider is a recreational trails advocacy group focused on improving trail opportunities on the African continent and proceeds of the event are channelled directly to trail projects. Amarider is focused on improving trail construction standards around the country and assist various mountain bike clubs to ensure that their trails are safe and environmentally sustainable.